The new website has now gone live. 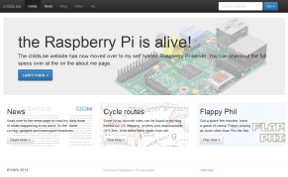 With the acquisition of my Raspberry Pi comes a whole host of possibilities. My Pi is currently running as the server for this website. Unfortunately the Pi is not powerful engough to run Wordpress or Joomla (who'd of thought they were processor intensive) - it does run, but a four to six second delay in spitting out a page is way too long. What I've gone for on my first crack is a flat-file CMS with blogging functionality as a plugin running stock Bootstrap and Bootstrap-theme CSS. I'm pretty pleased with the first real attempt. It needed some mods out of the box but I'm happy with it for the moment. I'm hoping to post some more articles on the trickier things I've come across when setting up the RPi. As a bonus in the mean time, I've reposted some posts from Blogger from a long while ago when I first though I'd start a blog but quickly ran out of stuff to blog about!